Most photos may be enlarged by clicking on them. Mouse over image. Where a hand appears indicates so. This feature is provided so that details can be studied. especially the first time viewing. Throughout the country, there is a resurgence in people getting back to "the good life." They want to know what they are eating. As a result, cities and towns are now revamping ordinances to accommodate the desire of these backyard farmers: Gardens with special watering privileges. Poultry. Rabbits. And more. However, there is NO OPPORTUNITY TO OWN YOUR OWN CATTLE in these provsions. Elmartin Farm's Beef Production Program provides a way for individuals, restaurants, food providers, and investors to own their own head or herd, have it roam in hundreds of lush Berkshire Hills acreage, and have it maintained by Elmartin Farm. In essence, with the investment in beef, one gets the use of land which is required to properly raise the cattle... plus the opportunity to experience the farm life which they are seeking in getting back to "the good life." Head / Herd Professional is maintained by a farm family of 8 generations. Progress reports and on-farm consultation -- if desired. Ability to select a breed for raising, when contracting for multiple heads. Create your own "signature" herd of Berkshire Beef; excellent for large beef users such as restaurants. Combined livestock, labor, and management costs yield competitive beef prices. Legitimate launch into the "green" agri-business; enjoy the governmental perks. Deductible business expenses for Restaurant / Purveyors... Capital gains for investors. Unique learning experience at no extra cost. Escape to one of The Berkshires most remarkable vistas of Mt Greylock, the highest peak in Massachusetts. The main Barn was built in 1952 by Bob Daniels , a Cheshire, MA builder. The structure is 200' x 50.' It was built to house 84 cows and had 9 calf pens, stalls for 9 heifers,3 bull pens, and 5 other pens. The cows were milked in their stanchions until a milking parlor was added to the front of the barn in 1980. The barn was the first in this area to have an inside hay conveyor to carry bales from the wagon on the barn floor area to the hay mow. 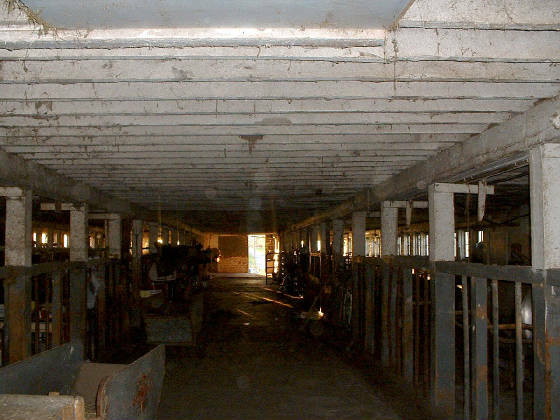 In 2008, many cow stalls were converted into stalls for horses. Along with 7 other pens, there is now room for 13 horses to be stabled in the barn. Other stalls are in a shed behind the barn. Despite the above, semi-permanent modifications, the barn remains capable of housing the same number of animals as orignally described at the top. Additionally, the milking rooms are in tact, though also not currently operational. 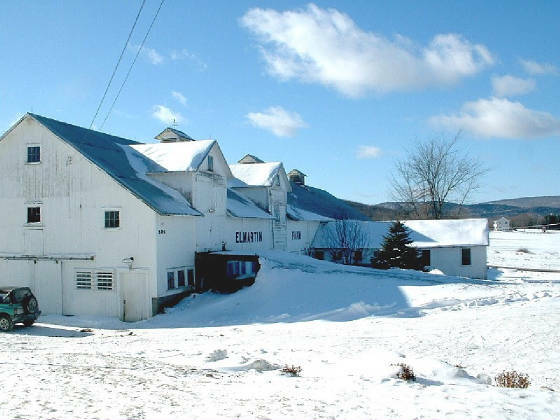 Once, exclusively a dairy farm, today Elmartin Farm houses many different animals ranging from livestock for consumption to pleasure animals for enjoyment. 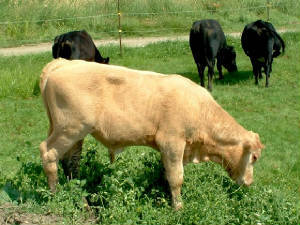 Beef animals are kept to be pastured during the summer. Steers are raised for folks who desire to know where their meat is coming from. Currently, there is capacity to house 40 head in the barn; and more outside. 1 to 2 litters of pigs are born each year and raise for meat. A flock of chickens is kept to supply fresh eggs. We have white, brown and green eggs which we use and sell. What would a farm be without a "Billy?" Much of the land is protected from development by the Commonwealth of Massachusetts Agricultural Protection Restriction Program. Therefore, the land will always be available for farming operations. The Commonwealth's Forestry Stewardship Plan is also in effect.